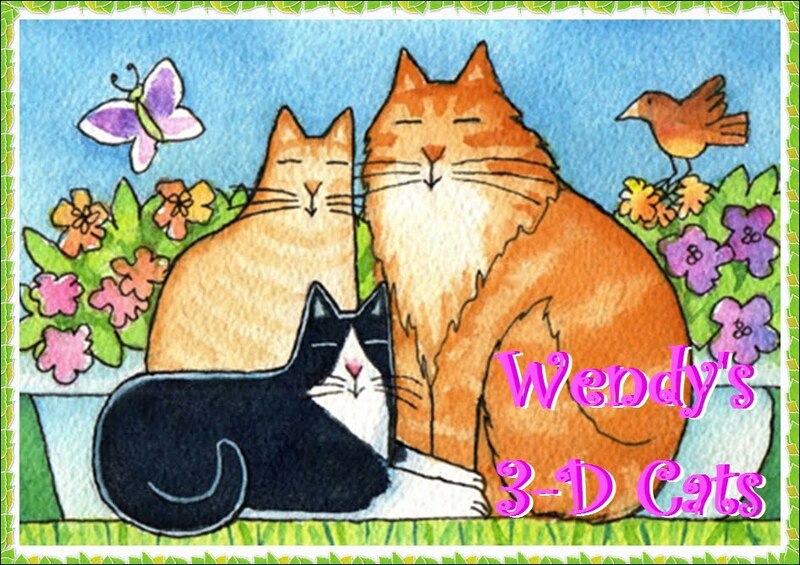 Wendy's 3-D Cats: DOMINO ANSWERS: MEOW, MEOW, ME, ME! "Domino, here! I jus' frew mai paws up in delite wen I wuz tagged by Kozmo of 'Cat from Hell' to doo 'Meow Meow Me Me'. 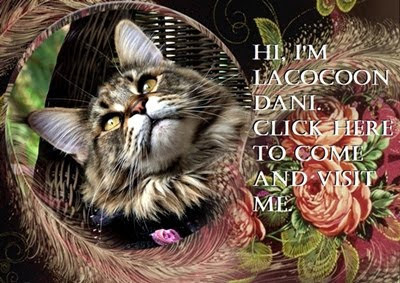 I fink he likes me cuz I'mma tuxy like him, an' we jus' met sews he PURRobly wonts to noe more abowt me -- so heer goes!" "Why, in mai baskit chair, of course!" ﻿2. Who is my kitty crush? "Mos' effuryone noes dat Milo is mai wun troo luv!" "We efun has our names carved in a twee outside mai howse!" "Dirty socks! 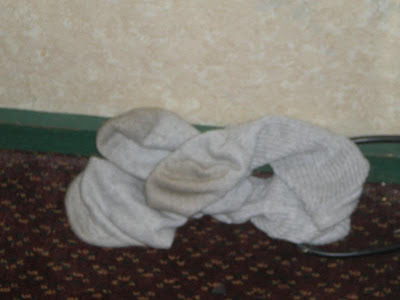 Mai Daddy leefs dem in sock puddulls all arownd da howse." ﻿4. What is my favourite TV show? 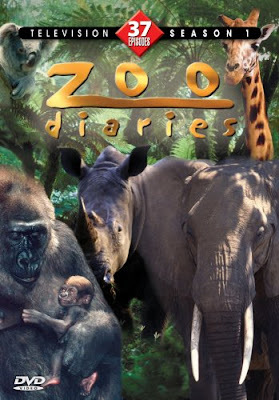 "Is a show called 'Zoo Diaries'. Is all abowt wot goes on behine de seens at da Toronto Zoo. I highly recommends it. Yoo kin efun gets it on DVD now!" 5. What is my favourite movie? "Shwek, of course! I reely likes dat Puss in Boots cuz he's a Mouse-Get-Heer, jus' like mai Milo! 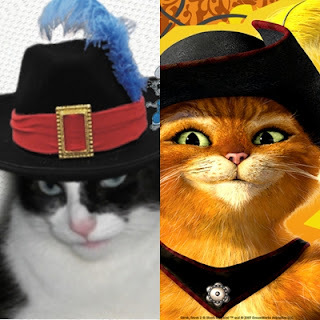 Puss in Boots is gonna has his own movie dis summah, and den dat will be mai fafurite movie. I jus' adoors dose swashbucklin' Mouse-Get-Heers!" 6. What is my Feline Wisdom? "Alwais strike PURRYemptively! I keeps mai brofurs in line by giffin' dem air swats an' a liddle hiss now an' den -- efun if dey didunt doo anyfing. It helps me maintain mai royal status as Queen of dis Howse. It duzn't mattah how small yoo are (cuz I is pretty tiny), it's da Cattitude dat counts!" 7. Who are the three kitties who I have tagged next for 'Meow Meow Me Me'? Tommy of "Crazy Cat Lady Carm"
"Next time I hopes sumbuddy asks me abowt mai cawreer as a modull. I gots a great portfolio!" Domino, those are some of the best answers I have seen. We love Shwek too. 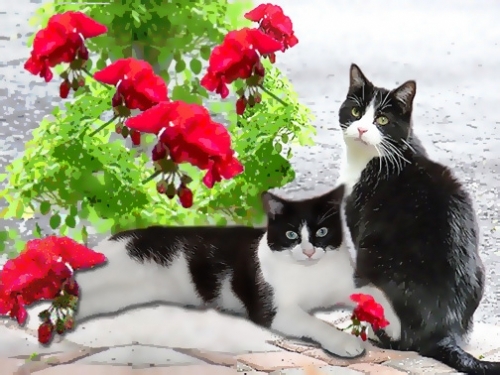 You and Milo do make the purrfect couple. Hope all of you have a super week end. How exciting to learn all those things about YOU! I am impressed! You are one beautiful cat girl and I still have a crush on you - even if you have a crush on Milo! What excellent answers Domino - we think you and Milo are a match made in heaven. You are excellent Domino! What good answers. Domino you are a fascinating cat that lets every Cat know that you are in charge. Great answers, Domino! And I can only imagine what a great modeling portfolio you must have! OMC!! Thank you BOOTIFUL Miss Domino! I'm glad I'm yoor true love! I'm very lucky! Thanks for telling us more about you, Domino! I'll bet you have a fabulous modeling portfolio! It was fun getting to know you more purrsonally!